After a strong musical performance on Tuesday night, it should come as no surprise to learn that Seraphic Fire, the most recent performer in Goshen College’s Performing Arts Series (PAS), already has two Grammy Award nominations to its name. The 14-person vocal and instrumental ensemble from Miami, Florida took the Sauder Concert Hall stage alongside the American Brass Quartet for an evening of classical music from both historic and living composers. In the first act, the combination of vocal and brass led the audience on a musical journey down the Camino de Santiago, a Spanish pilgrimage trail that crosses Spain and ends at the shrine of Saint James the Great in the cathedral of Santiago de Compostela in Galicia. Selections from 14th-century Spanish composers, such as Sebastián de Vivanco, Antonio de Cabezón and Tomás Luis de Victoria, comprised much of the second act, which was dedicated to the classical Spanish style. There were also anonymous works from the 14th century such as “Libre de Vermell,” a manuscript of devotions, and “Codex Calixtinus,” a 12th-century manuscript devoted to the Book of Saint James. 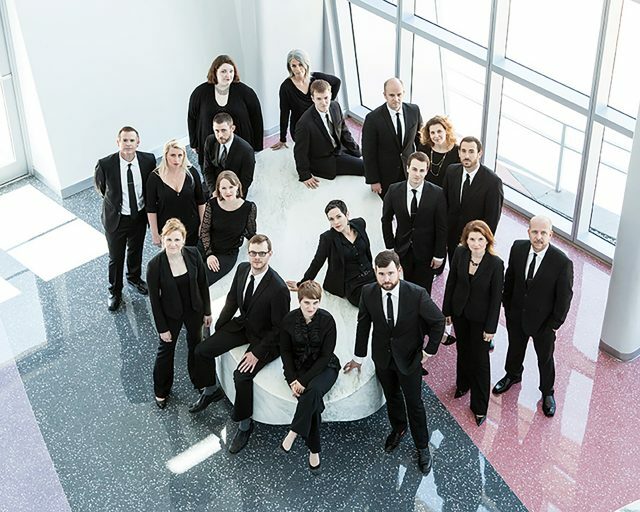 Conducted by Patrick Dupré Quigley, the group’s founder and artistic director, the Seraphic Fire ensemble consists of four soprano, three alto, three tenor and three bass voices. The group also includes an organ player for their more traditional repertoire. Marcia Yost, director of the arts outreach and engagement at Goshen College, said that besides being on the 2018-2019 PAS roster, Seraphic Fire was invited to sing on the Sauder stage because of the good rapport that the college already holds with the ensemble and its musicians. Conspirare, also a predominant SATB vocal ensemble, performed their original concert “Considering Matthew Shepard” on Sept. 14, 2018 as the kick-off event to this year’s PAS. Yost also said that it’s not uncommon for Seraphic Fire to team up with other musical groups or ensembles for their tours. In this case, that partner group was the American Brass Quintet. Each movement celebrates an aspect of the human spirit, like “uncrushable work ethic” and “our common quest for joy.” The piece itself was commissioned and premiered by the Juilliard School in celebration of the American Brass Quintet’s 30th anniversary. The first is an arrangement by American composer Jake Runestad, featuring scripture from Psalm 121 as the lyrics. The second, a piece in three movements by American avant-garde composer Ingram Marshall, is a mournful call for God to ease our suffering. This concert was a part of the 45 total concerts that Seraphic Fire will perform this year over eight subscription programs. Both ensembles are passionate about the educational outreach that they offer to schools and the community. Seraphic Fire has four programs that are meant for musicians in elementary to graduate school and have thousands of participants annually. The American Brass Quintet offers a series of mini-residencies while they tour, giving young classical musicians the opportunity to develop in an “intense chamber music experience” over a period of several days. Upcoming PAS events include Academy of St. Martin in the Fields on Wednesday, Feb. 27 at 7:30 p.m. and The Step Crew on Friday, Mar. 29 at 7:30 p.m. Both events will be in Sauder Concert Hall. Tickets are available through the Goshen College Music Center box office.